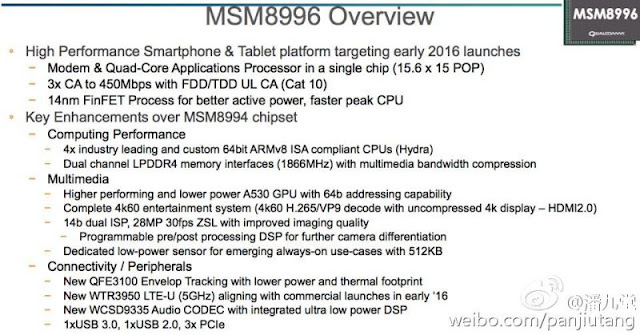 The Snapdragon 810 chipset might go down in history as Qualcomm’s biggest failure to date. The silicon piece suffered from overheating issues ever since its inception and ended up causing troubles for handsets being sustained by this platform, including the HTC One M9 and Xperia Z3+. But Qualcomm is looking to make amends with its next-gen Snapdragon 820 platform, which is based on the company’s own custom cores dubbed Kyro. And according to freshly squeezed information, the US chip giant will be introducing the SoC in Los Angeles on August 11. 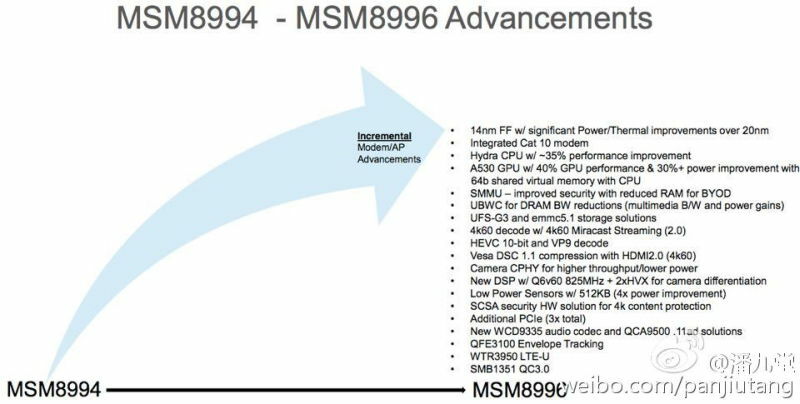 Today, thanks to well-known Chinese analyst Pan Jiutang, we get to look at the specs of the chipset, even before Qualcomm has had a chance to detail them for us (as spotted at G for Games). Jiutang’s Weibo account leaked a few screenshots that detail the new silicon piece and give us an image of how powerful the Snapdragon 820 really is. The images show the differences between the Snapdragon 810 and Snapdragon 820, with a focus on the 35% performance jump in the CPU department and the 40% improvement on the GPU front. 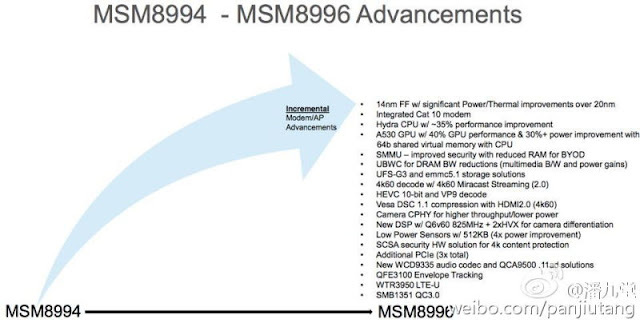 The upcoming silicon will be manufactured using Samsung’s 14nm process instead of the 20nm used for the Snapdragon 810. Due to the use of this technique, the chip needs 30% less power, which means the temperature on board should remain quite cool. Another interesting aspect to take into account is the new Hydra CPU design, which takes advantage of Qualcomm’s own core designs rather than ARM’s. The images show a lot of information, but the most important aspect you should keep in mind involves the new A530 GPU being 40% faster than the previous version. There’s also a Cat 10 LTE modem built-in, that on paper is capable of supporting pretty much any LTE standard and the highest speeds. The chipset can also handle 4K content at a smooth 60fps. Qualcomm is poised to start shipping the Snapdragon 820 chipset to partners towards the end of 2015, but don’t expect to see a device fueled by this chipset this year. Actually, the same analyst who leaked these screenshots says that the first smartphone to take advantage of the Snapdragon 820 is poised to be the Xiaomi Mi5 Pro, which is due out in March. It all sounds pretty exciting.